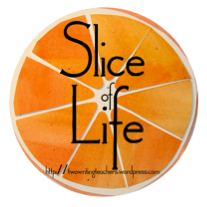 Two Writing Teachers is the host of Tuesdays' Slice of Life. Check out the website to read more Slice of Life stories. I spent five hours in a car Friday afternoon. Five long hours. My stomach felt a little queasy from the stop-and-go traffic. My legs were in desperate need of a stretch by hour two. By the time my colleague and I got to New York City we just wanted to park and get out of the car. We spent another half hour or so in the car, trying to navigate the intense city traffic as we searched for the parking garage. We looped around again and again and finally found the parking garage beneath the Museum of Natural History. We made it. Although it was a long car ride, I was quite happy and excited about spending the next at the Teachers College Reading and Writing Project Saturday reunion. Overall it was a wonderful day of learning and conversation with others about one of my favorite topics - literacy. I would definitely drive the five hours there and back to attend again. The March Saturday reunion will be their 90th event and Lucy Calkins hinted that the project would somehow celebrate this. If you can get to New York City, I would highly recommend attending. You'll walk away with a greater understanding of how to support students in developing reading and writing habits that will help them become independent. You'll also learn new instructional strategies and ideas that can be implemented in the classroom. The Saturday reunion was a worthwhile professional development experience and I look forward to the next time. Sounds like the conference was well worth the drive and I hope you got a chance to enjoy New York City after. Dinner in Times Square was a perk of the trip as well. Oh how lucky you were to be there - such a great place to learn and share the joys of teaching. It's always lovely to be around people who share the same passion for teaching and literacy. My elementary colleagues attended this, too...everyone had rave reviews - but your post adds so many more details! Thanks for sharing! So glad you went! It's a busy day and it's all very crowded, but so worthwhile. What a gift Lucy gives to the world of educators who are able to attend. I need to start plotting how I can make this happen. It's a wonderful gift. If you can find a way you should definitely go. I've never gone either... but your post has me wondering if it'd be worth the trip from Chicago!